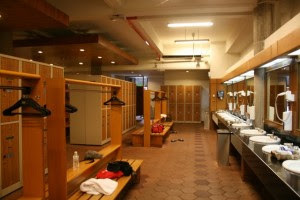 A group of men are changing in locker room at a golf club. Suddenly a cell phone on the bench starts to ring, and a man puts it on speaker phone as he continues getting dressed. He says "Hello? ", the woman on the other line says "Honey, it's me. Are you still at the golf club?" "I'm out shopping and found this great new leather coat, and it's only $500 dollars, can I get it?" "Sure, if you like it." "Thank you! I was also at the dealership earlier and saw the new Mercedes models, and there is one that's absolutely gorgeous, and I really want it!" "Alright, but for that price I want all the extra options included." "Great! One other thing. The house we wanted last year is back on the market, but they're asking for 1,500,000." "Well, go ahead and make them an offer, but don't go above 1,250,000." "Really? Okay! I love you, see you later!" The rest of the men in the club stare at him wide-eyed. As he hangs up the phone he looks at the men and asks, "Anyone know whose phone this is?"